As the headline of this post implies, there are three distinct weather stories in New Jersey's forecast this week. First, we'll kick out the clouds and dampness and warm up. 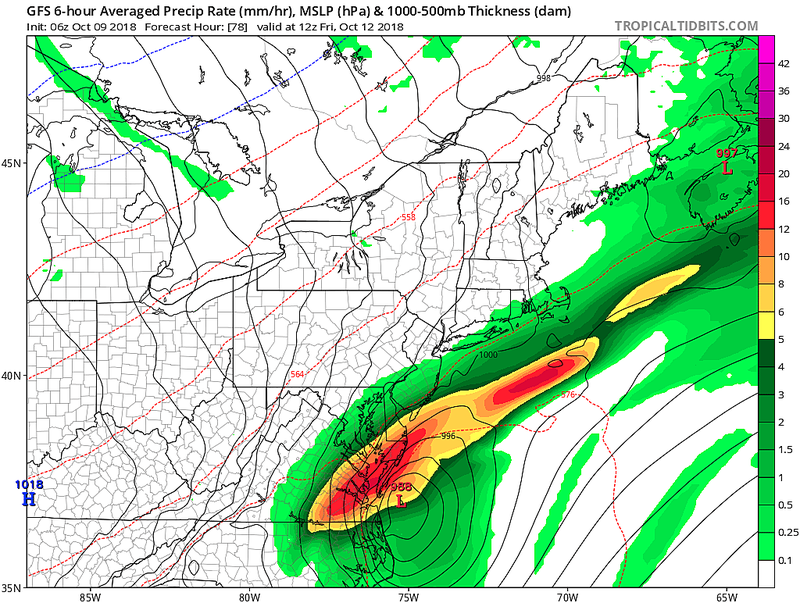 Second, the impacts of Hurricane Michael's tropical moisture will arrive in New Jersey with rain and wind. And third, a major cooldown will make for some truly autumnal temperatures. Throughout the entire Columbus Day Weekend, we just couldn't shake the dreary dampness hanging in the air. Some combination of rain, showers, sprinkles, mist, fog, overcast skies, and cool temperatures were with us for the duration. Blah. I am optimistic that a shift to southerly winds will kick out the grey, and introduce peeks of sunshine to the skies of Jersey. For Tuesday morning, we're still dealing with locally dense fog and misty drizzle. But Tuesday afternoon looks brighter, with mostly to partly cloudy skies. Even a hint of sun will push temperatures into the mid to upper 70s. I wouldn't be surprised to see a few 80s somewhere in the state. Tuesday night will be quiet, with partly cloudy skies and probable fog. Lows only dip into the upper 60s — kind of summer-isn. Wednesday is going to have a "summer" feel to it too. It will be the warmest day of the week — pretty sticky, in fact — with high temperatures on either side of 80 degrees. Hurricane Michael has now entered the warm waters of the Gulf of Mexico. As of 5 a.m. EDT Tuesday, Michael is a category 1 hurricane, with maximum sustained winds of 90 mph. It is expected to strengthen over the next 24 hours, peaking right on the edge of a category 3 "major hurricane". Landfall is expected early Wednesday morning somewhere along the Florida panhandle. Gulf landfalling tropical systems always raise an eyebrow here in New Jersey. The latest track shows a period of "nasty" weather here, but the threat for really "dangerous" weather will be limited. We already had rain in the forecast for Thursday-Friday, from an approaching cold front. As Michael's tropical moisture rides along that front, it will dramatically enhance the rainfall — in other words, make it much heavier and steadier. It does look like a pretty wet day, although not every forecast model paints a total washout. Rainfall totals could exceed 1.5". In addition, it's going to get pretty windy, with regular gusts over 30 mph throughout Thursday. Because of the storm's location and orientation, no surf or surge impacts are expected along the Jersey Shore. That windy, rainy weather will actually arrive way ahead of the storm itself. 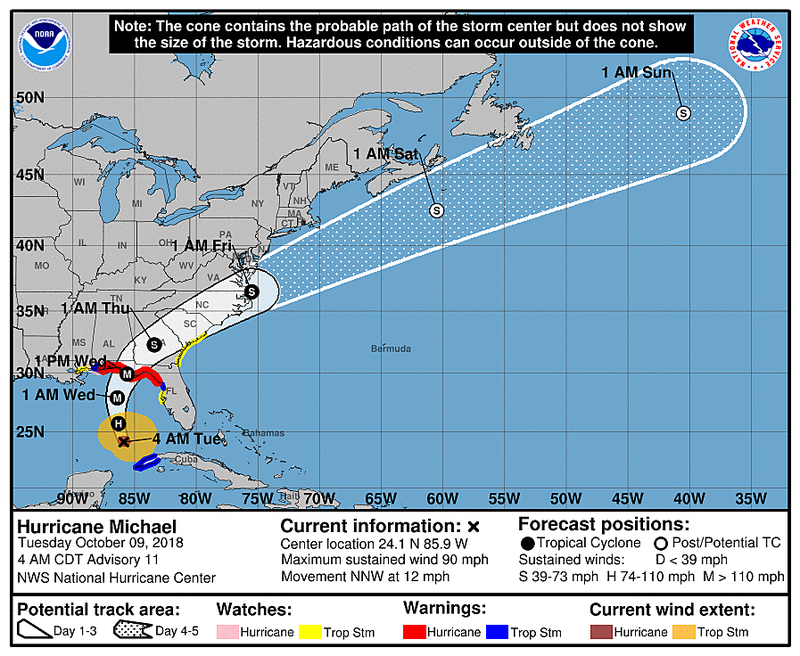 Michael is forecast to eject into the Atlantic Ocean somewhere between Maryland and northeastern North Carolina, most likely as a tropical storm. 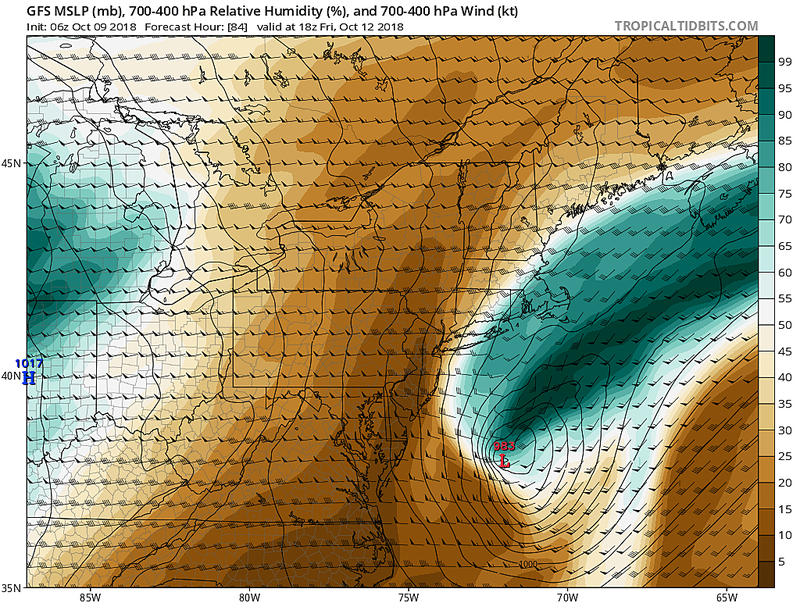 Well enough south of New Jersey to hopefully avoid direct impacts. But that part of the track and timing forecast is the big question. If the storm nudges northward, we could have more downpours and gusts on Friday morning, especially in South Jersey and along the coast. Here comes fall! Behind Michael, a cold front will sweep through New Jersey on Friday. As skies clear, temperatures will tumble. While we'll start Friday morning with temperatures still in the 70s, thermometers will fall to about 60 by Friday late afternoon. It will be breezy, if not blustery, with wind speeds still in the 20+ mph range. And for those who've been craving a beautiful, cool, crisp autumn day — Saturday is your day! Sunny and lower 60s. Typical "Halloween temperatures". In fact, I'm pretty certain our first frost of the season for NW NJ (at least) will happen this weekend. Temps there will likely drop into the upper 30s by Sunday morning. And Sunday will remain cool, with 60s and increasing clouds through the afternoon. Our next storm system arrives in the Monday-Tuesday neighborhood, with another threat for periodic heavy rain.